February is CSA month on the Seacoast! It’s the month of the year when many farms open their registration for CSA and farm credit programs and when Seacoast Eat Local hosts CSA Days at both of its winter farmers’ markets. Seacoast Eat Local is teaming up with local farms to understand trends around CSA programs. If you have NEVER had a CSA, or have had one for years, please consider completing our survey. CSA stands for Community Supported Agriculture. They come in MANY shapes and sizes, but the general gist is that individuals/families sign up and submit payment for a weekly share of a farm’s products that they receive through the length of the growing season. Some CSAs work more like farm store credit. A customer essentially purchases a gift card or credit that they can use in the farm store/stand. Other CSAs are what’s considered a more traditional ‘box’ of food. It may contain only vegetables, or veggies plus meat, eggs, dairy, bread and/or flowers. It depends on the products that farm creates and what other relationships they may have. Sometimes you can have an ‘add-on share,’ such as a veggie CSA with a farm where you pay an additional fee to also receive local bread. With some CSAs, the weekly box is assembled for you and with others you have the option of choosing from a certain amount of available products, giving you more choice over what you take home. CSA seasons vary in length from 8-22 weeks. Every farm is different and there are as many options as preferences. Typically, these style CSAs are picked up once weekly either at the farm or at a common location/farmers’ market. Why are CSAs Absolutely Critical to Farm Health? If you are interested in supporting local farms and agriculture, purchasing a CSA is one of the most impactful actions you can take. When an individual or family signs up for a CSA in the winter months, they are providing vital income for a farm when they need it most, but traditionally are earning the least. In the winter months farms are already hard at work planning the coming season- purchasing seed, investing in equipment or infrastructure and preparing to hire staff. Providing a financial boost at this time is hugely helpful to farms and also assists them in planning their crop size for that season, which reduces waste. Not to mention, customers receive a season of delicious, healthy and local foods while establishing a strong relationship with their local farmer. There are many ways to find a CSA! Do you pass a local farm on your daily route? Have you ever asked whether they offer a CSA? Asking your local farm is just one way to find a CSA. There are many others. 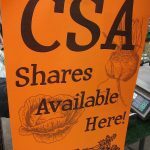 You may search our website, www.seacoastharvest.org for a listing of CSAs or visit our CSA Days at the Winter Farmers’ Markets on February 11 and 25 to see a sampling of what is available in our area. How Do I Know which CSA is Right for Me? There are as many CSA options as there are farms, which is a lot! The most important factors to consider are your own schedules and preferences. Is the CSA pickup location accessible to you? Are you able to commit to the pickup each week? What is the procedure for when you need to skip a weekly pickup? Are the typical offerings acceptable to you? Make no mistake, a CSA is a commitment and customers should do their homework by asking about the pickup procedure, season length, typical products offered and other information. There is no right or wrong CSA, just ones that will or won’t work best for you. Emily’s Post: Getting Started with SEL!